Depending on who you ask, David Lane, aka Davey J aka Elvis, is the current Don of Canberra suburb, Braddon. Davey Lane acquired this elusive title as a direct result of services rendered from his former posting as the inaugural Mayor of Page in Canberra’s north in the late 1990’s. 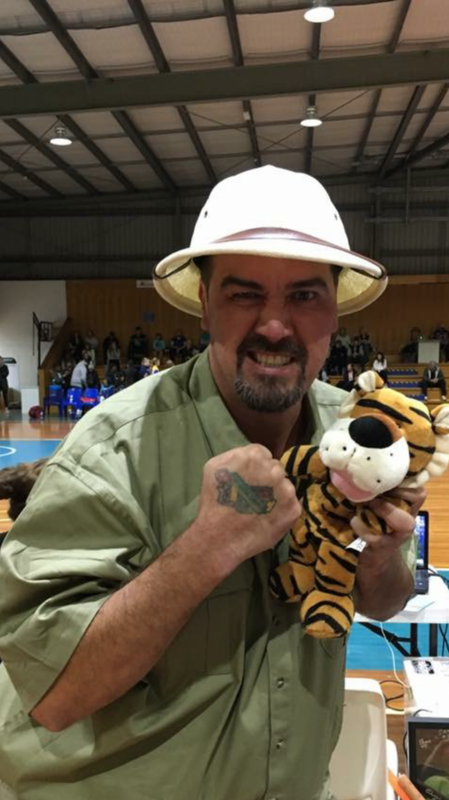 A passionate and dedicated community sports patron, you can always find David at a local sports game by following his rambunctious and warm voice, filling any stadium, ground or court he is at with encouragement and enthusiasm. Now that voice might be just hanging with you in the stands or announcing the actual game with such enthusiasm even the most disinterested of millennial will put their phones down and be on the edge of their seats. 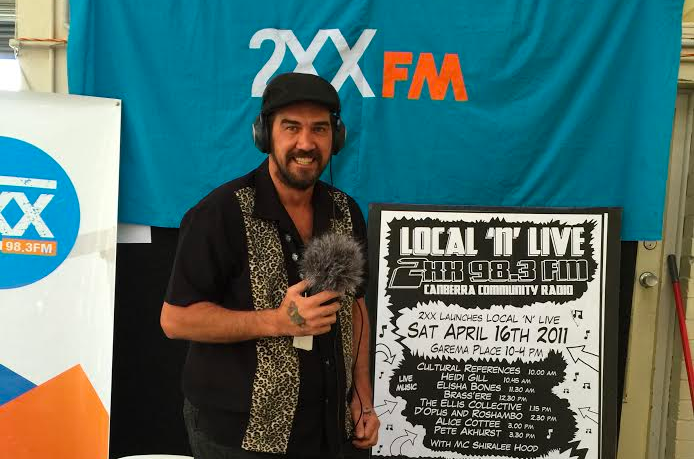 Every Saturday morning from 8.30 am you will find Davy J’s boisterous voice broadcasting on 2XXFM 98.3FM on his show “The Big Gee Up”, the only radio program in Canberra that exclusively discusses local ACT sport. From roller derby to ice hockey, badminton to basketball, if it’s about a local sport, David shares all the scores, gossip and details. David’s laughter is infectious, it’s giggly and lively vibrations are felt a good forty seconds before you actually see or hear him. Unsurprisingly David’s broadcasting talent and delightful voice box won him the Troy Garner Award for Excellence in Sports Programming from The Community Broadcasting Association of Australia last year at their National awards. If you haven’t yet had the chance to meet this local legend, make an effort to do so, it is a local encounter bound to leave you feeling joyful and completely included and a part of our national capital. If it happens to be this week you stumble across Davey J, holler out “Happy Birthday” as he celebrates being born this week. Name – David Lane (AKA Davey J AKA Elvis – depending on who you talk to). Occupation – Public Servant (but aspiring radio star). How long have you lived in Canberra – I moved to Canberra in 1993 for an opportunity to attend UC. While my academic career faltered badly (I blame those US College movies of the 80’s for influencing my party hearty approach to studying), I realised Canberra was my kinda town and have now been here 24 years. North, South or Q-town – I was previously the Mayor of Page, but am now the Don of Braddon. Most memorable event attended in the ACT – I’ve been to some amazing things in Canberra, but one of the most memorable events that I attended was a Brumbies game in the mid 2000’s. I was working as the match-day presenter and was able to wish my mother a happy Mother’s Day on the big screen in front of 18,000 people. While the game wasn’t that memorable, the 18,001st person in the crowd was my Mum. She gave me a big hug after the game. Things you love about Da Berra – The sporting community. As the host of a sports show on 2XX (The Big Gee Up – 8.30am-10am Saturday), the passion, dedication and commitment of our region’s associations, players and officials always inspire me. What you loath about the city – Like most people, it’s probably our reputation as terrible drivers… however we tend to do ourselves no favours in trying to change it. Most cherished memory in the capital – A recent one probably tops the list. In 2016 I won the Troy Garner Award for Excellence in Sports Programming at the annual CBAA Awards. It was a total surprise that I received the award, and it took a few days to come to grips with the fact we were recognised as the best community sports show in Australia. So I owe plenty to the amazing sporting community in Canberra. Which Canberra local do you most admire and why – No-one specifically as the region continues to produce world class sports people, musicians, artists, actors, academics and creatives but if pushed, I’d probably nominate my kids – Toby, Darcy and Jonte – they have the talent to be anything they want and are great people to hang around. Most precious item you own – I’m a bit of a hoarder, but the two things I probably cherish more than anything are the Year of the Robot EP by my band GoRT – it was the culmination of a dream that I will always be proud of, and my plaque for playing 100 games for Western District Rugby Club – as a lad who moved around a lot, that achievement meant I’d found a home. First Canberra kiss and where – As a gentleman, I don’t kiss and tell, however, I will say it was at the Private Bin. Most delicious Berra place you adore eating at – So many great places to eat in Canberra these days, but nothing beats a great BBQ at home. What do you want to be when you grow up – An NBA basketballer. I am just waiting for that growth spurt to take me to 7-foot….!!! What is a question you would like to ask everyone in Canberra – Are you excited for light rail ??? Caption’s: Top, David Lane Spreading the word on 2XX at the CAP Expo – Photo by Elena Kemezys. Middle, David Lane – Getting the crowd going court-side at the Canberra Gunners vs Capitals Academy home games – Photo by Lachie Ross. 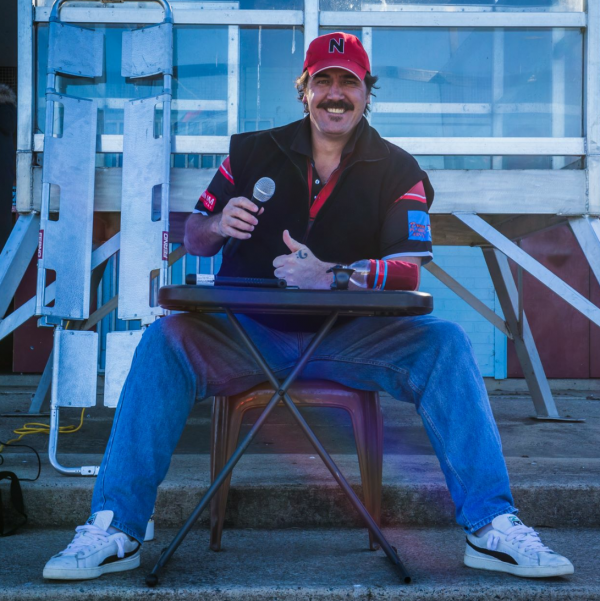 Above, David Lane – Match-day Announcer for the North Canberra Bears – Photo by 5 Foot Photography.